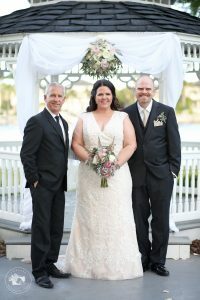 Kristel and Vince’s wedding ceremony took place in mid-February at the beautiful Davis Islands Garden Club. Kristel looked amazing as she was escorted by her father down the garden path to join Vince in front of their wedding gazebo. There, in front of their family and friends, the couple shared their vows, exchanged rings, and were pronounced husband and wife by Rev. Rick Lackore of Sensational Ceremonies. Ceremony Music and Sound provided by Jason with Grant Hemond and Associates, Inc. Special thanks to Buffy and Emily with Life Long Studios for providing this beautiful image of the happy couple after their ceremony. Congratulations to the new Mr. and Mrs. Vince Brammell!